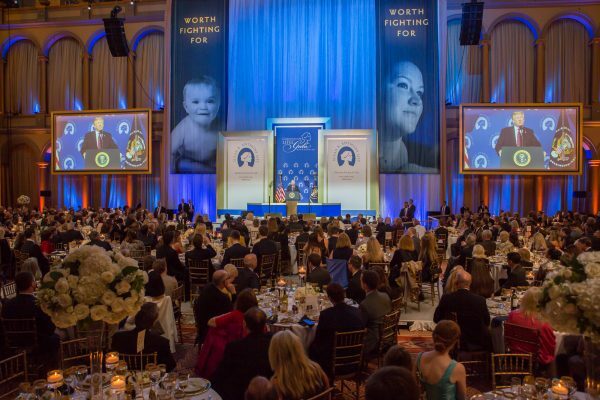 Speaking at the Susan B. Anthony List’s Campaign for Life Gala on May 22, President Donald Trump rallied pro-life advocates to vote for Republicans in the upcoming midterm elections. “But every day, between now and November, we must work together to elect more lawmakers who share our values, cherish our heritage, and proudly stand for life,” he said. More than 1 million unborn babies lose their lives to abortion every year in the United States, according to Susan B. Anthony (SBA) List, a nonprofit that seeks to end abortion in the country. SBA List’s canvassers visit homes all around the country to maintain a pro-life Congress by educating voters about lawmakers who advocate for anti-abortion laws. This year, the campaigners aim to reach 2 million voters before the elections in November. “He has been reforming the courts at a record pace with judges who respect life, the Constitution, and the will of the American people,” she said. Trump has taken several actions to support the pro-life cause. Soon after he took office, he reinstated the Mexico City Policy, a Reagan-era rule that prohibits U.S. foreign aid from funding abortion centers overseas. He also ended U.S. funding of the U.N. Population Fund, after discovering that the organization supports abortion and forced sterilization in China. The Trump administration has recently proposed a new rule to prohibit Title 10 funding from going to any clinic that performs abortions. “For decades, American taxpayers have been wrongfully forced to subsidize the abortion industry through Title 10 federal funding,” he said. Trump earlier signed a resolution, overturning an Obama-era regulation that forced states to fund certain abortion facilities in their federally funded family planning programs. He has also backed the Pain-Capable Unborn Child Protection Act, which aims to end late-term abortions after 20 weeks of pregnancy, the point where an unborn child can feel pain, according to medical studies. The bill passed the House, but now awaits action by the Senate. The Senate fell nine votes short of passing the 20-week abortion bill in January. The United States is one of only seven countries in the world that allows elective late-term abortions, along with China, North Korea, and others. 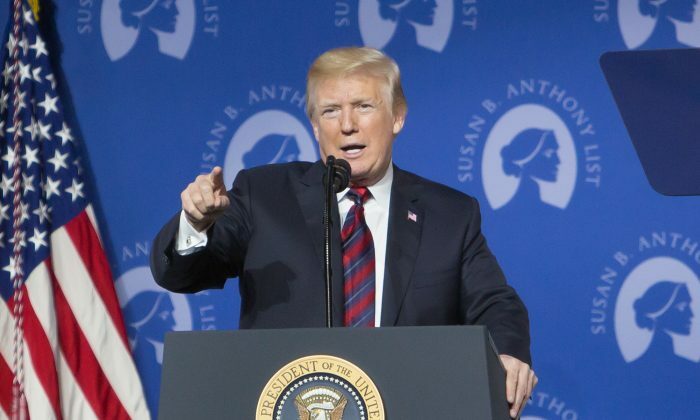 Trump criticized the effects of the 1973 Roe v. Wade Supreme Court decision, which ended many state and federal restrictions on abortion in the United States. In addition, he has taken several actions to support religious liberty and protect individuals’ conscience rights. A Gallup poll taken in May 2017 shows that more Americans believe abortion is morally wrong (49 percent) than morally acceptable (43 percent). Of those polled, 18 percent say abortion should be illegal in all cases, 50 percent say it should be legal in only certain circumstances, and 29 percent say it should be legal in all cases. Susan B. Anthony was an American activist who played a key role in ending slavery and securing women’s right to vote in the United States.